1. God’s law is perpetual, because it’s based on the holiness of God. This is the right understanding of the relationship between section 1 and section 2 of chapter 19 in the WCF. Thus the reference to “this law” in section 2 is referring to the moral law established by God’s holiness as principle/rule not as the covenant of works reduplicated in the Mosaic Law. 2. Man has always been obligated to obey God’s law in its fullness; whether in the Garden of Eden or in the heavenly Jerusalem. Thus, both believers and unbelievers are called to be holy as God is holy (see point 1). 3. Without this perfect holiness no man will see God. Thus, anyone who can be perfect as God is perfect can be in the presence of God. Alternatively, anyone who is not perfect will not be able to be in God’s presence. 4. Consequently, there is always a sense of the covenant of works principle operating in all dispensations of redemptive history. That is, if man can be perfect they would inherit for themselves eternal life. 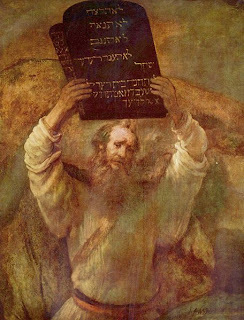 In this sense, one can argue that there is a covenant of works principle in the Mosaic Law, although this is no different in the Abrahamic or New Covenant. 5. Man is unable, because of his sin, to obtain eternal life by fulfilling the law’s demands. Thus the covenant of works principle was only able to be filled by Adam in the garden and the Son of God, Jesus. This is why some have called it a “hypothetical” principle. "In this sense, one can argue that there is a covenant of works principle in the Mosaic Law, although this is no different in the Abrahamic or New Covenant." In other words, I find it appropriate to speak of a covenant of works priniciple operative in all dispensations of redemptive history. Of course, one may say that we ought not call it a covenant of works principle, and I'm fine with that as well, so long as the substance is still affirmed. What I will be arguing in the future posts is that this principle just enunciated is the only way to speak of the Mosaic covenant having a covenant of works principle (contra Kline, Horton, Karlberg, etc...) So, to speak of God administrating a covenant of works principle on the national level is inappropriate IMO. You were very broad in your opening statement so forgive me if this also is broad. Adam (and all he represented) was under a Covenant of works. Adam was the visible representative of the people of God. Adam broke the Covenant of works bringing the judgment upon himself and everyone that he represented. Adam and his prosperity died spiritually and a physical death sentence was brought upon them (us). God in His graciousness promised the Savior to redeem a people unto Himself. The Abrahamic Covenant promised the descendents of Abraham a land, a Kingdom etc. In the Mosaic Covenant these descendants of Abraham are given a land, a Kingdom etc. These people are the visible representatives of the people of God and are told that if they obey they will keep this land and Kingdom but if they disobey they will lose it. Later God divorces Israel because of their disobedience specifically their worshiping of false gods. Once Nebuchadnezzar takes away Judah in 586 b.c. the Jewish people never again come close to possessing the land and never again have a kingdom. Only for a short time during the Maccabean era did the Jewish people govern themselves but this was more akin to the time of the Judges nothing like a kingdom. Paul in Galatians tells us that the true fulfillment of the Abrahamic Covenant is found in Christ and in the New Covenant. The law was not cast aside, Christ fulfilled it and we are credited with this fulfillment by our Union with Christ. The graciousness found in the Abrahamic Covenant was present in the Mosaic Covenant and we can see it in the sacrificial system and the future promise of the coming of the Messiah. Now the church under the law of Christ is the visible representative of the people of God. When Christ returns the sheep will be separated from the goats and the people of God will enter into their rest with their savior for eternity. We will be law keepers for eternity because of our Union with Christ. Interesting, Mike. You know I lean Klinean on this - I look forward to reading your points!